Aside from the falls themselves, if there’s one thing that Niagara is most famous for its weddings. People from all over the world come to Niagara to celebrate their nuptials, and as we all know there is a lot of planning that goes into a wedding, and a destination wedding can prove to be a bit more complicated. If you’re the type of couple that prefers to do their own wedding planning then you’ll know the challenges that you’ll come up against. Luckily, wedding vendors in Niagara make it very easy to get everything in place for the wedding of your dreams. 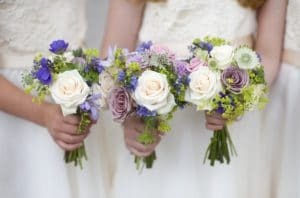 As flowers are one of the most important aspects of any wedding, we’ve come up with a list of some of the best florists in the area and any of these are sure to provide the blooms and greenery to make your special day a lot more colorful. Elegant and classic, Fleurish Design Studios in Niagara specialize in wedding arrangements and bouquets, and create beautiful, one of a kind floral designs that will take your breath away. From handheld bouquets for the bride and bridesmaids to boutineers for the men, the professionals at Fleurish will work closely with you to create the colors and styles to perfectly compliment your wedding theme. They’ll also help you assess your venue and create stunning centerpieces and other arrangements that you may need for the church or reception location. Another of the area’s most popular wedding florist is Wine Country Floral, the exclusive florist for Vineland Estates Winery. They pride themselves on their one-of-a-kind arrangements and delight in using seasonal blooms and greenery, as well as cutting from their own gardens. They service venues across the Niagara region and their florists offer professional consultations to ensure that the end result are the flowers you’ve always dreamed of. In addition to exquisite bouquets, they will also design and arrange blooms for your ceremony and reception locales, as well as flower crowns, boutonnieres, and any other flower request you may have. Serving nearly every wedding venue in the region, Crescent Gardens Florist is one of the most popular choices amongst brides in the Niagara region and for destination weddings. Each arrangement is carefully handcrafted using only the freshest flowers, many of which are sourced locally. Crescent Gardens will take charge of all the floral needs for your wedding, including bouquets, centerpieces, church flowers, floral archways, and more. In addition, because they are so familiar with the venues in the area, their professionals can guide you on style and design choices that will suit your personal taste and accent your wedding location beautifully. Following in the footsteps of countless brides and grooms who have tied the knot in Niagara, a wedding here is definitely an event to savor for a lifetime. If you’re planning a Niagara wedding and need to have your flowers and arrangements professionally designed and created, any of these florists will suit your needs perfectly. 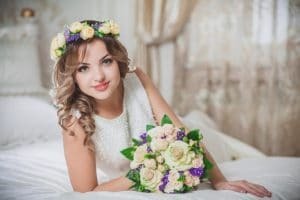 And once you’ve place your flower order in the hands of one of these local florists, you can relax a bit and move on with the other plans for your special day.